If you were to look at the stats of how many pets needed to be rescued each year (around 200,000 pets - slightly more than half of these dogs and slightly fewer than half of these cats) vs how many pets ARE being rehomed each year, you'll notice something happening. Rescue don't have the capacity required to save even half these animals. Rescue can't double their output. 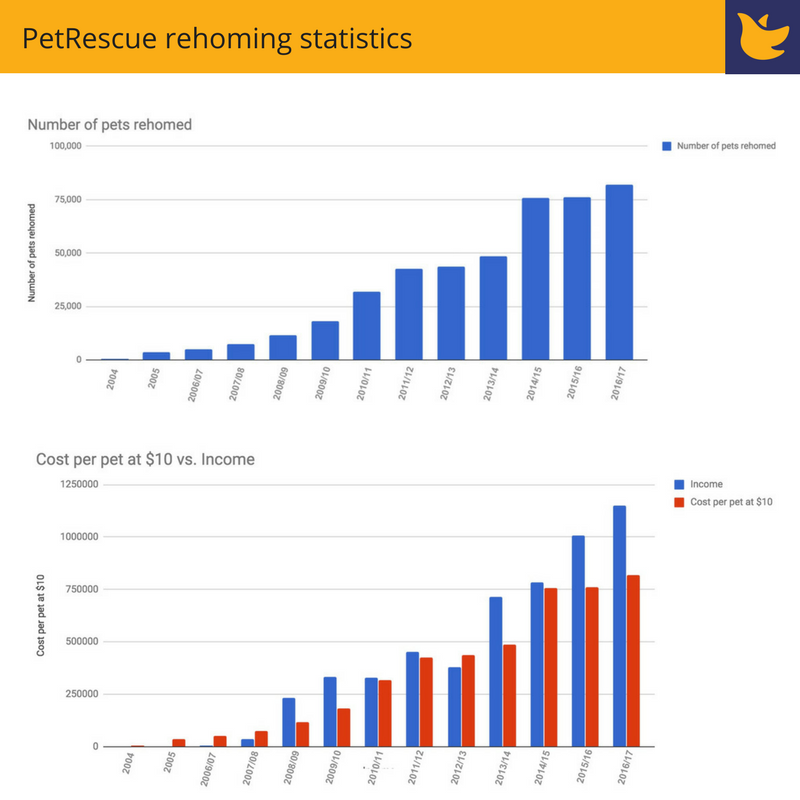 PetRescue was always going to struggle to crack 100,000 pets rehomed, and despite the community investing just shy of $3 million dollars in the organsation in the last three years, the number hovers stubbornly around 75,000. Why? Because foster carers are like super hero unicorns. This is not PetRescue's fault. There's just a natural upper limit to how many people want to run rescue groups and how many pet lovers are willing to foster. They can't be. They cannot double their output. Well, there is a problem being created by PetRescue which is starting to bite and is likely to only get worse over time. While the numbers of pets being adopted is leveling out, PetRescue is exponentially increasing its revenue. Nearly entirely by increasing the number of donors it's recruiting and donations it's securing. So while in the past it claimed each pet costs "$10" to rehome (which to anyone working in rescue would seem quite generous), this year that number crept up to over $14 per pet. So we need to be asking - do any of these programs help rescue groups rehome more pets? PetRescue's own figures are saying after three years - probably not really. Do these programs lighten the load of rescue? I'm sure some food and a Facebook promotion are a pleasant surprise, but they do not make for a viable rescue group. Practically ALL of these programs and services are neat - but utterly superfluous to the needs of rescue. They're nice to have. But not increasing rescue capacity, nor making it more sustainable to be a rescue. And by taking mo-moneey! to provide these services, as I've written before, PetRescue is making rescue LESS sustainable as the donors who would have given them the cash they needed to operate, are rapidly sucked into the PetRescue monolith. So there's a very, very easy answer to all this for rescue. And it doesn't mean losing access to the PetRescue website. Tell PetRescue you don't want their other super-dooper-we're-awesome-look-at-us services. You don't want their food. You don't want their advice and resources. You don't want to attend their events or participate in their promotions. You don't want their raffles, giveaways and photoshoots. You don't want to feature on their social media pages, or in a corporate promotion. You don't want their donation button. You don't want their handouts. You want to opt-out entirely. You don't want any other service... except a website. Cost less. Do less. Be less. Stop wasting these precious resources and stop stealing from the industry they claim to serve. And its not helping animals, or rescue. *There is an answer, more reading for you here.